Your child is screaming in pain. Clearly something is wrong, but by the time you get to the doctor’s he is playing happily as if nothing had ever happened. It’s not until you get home that the spasm of pain comes back. Intussusception is a significant cause of abdominal pain in children. A portion of the intestine telescopes in on itself. The wall of the intestine swells and bleeds as its blood supply is blocked. It is a true medical emergency. Intussusception is the most common cause of intestinal obstruction in kindergarteners, preschool children, toddlers, and in babies after the early newborn period. Most cases of intussusception occur in the first year or two year of life. It happens more often in boys than in girls. Most children with intussusception are otherwise healthy, but some have GI conditions such as cystic fibrosis that predispose them to this. Intussusception is more common in the spring and the fall. It may occur during an adenovirus infection. The classic symptom is sudden, severe abdominal pain that comes and goes. During a period of pain, the legs are often pulled up. Vomiting is common. 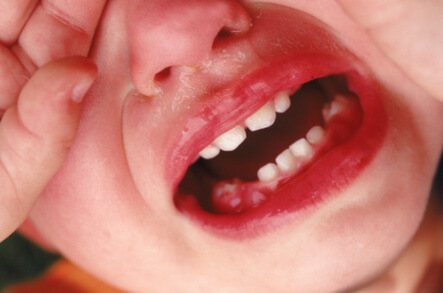 Between pain spasms, the child may be happy and show no symptoms at all. As the hours pass, however, the child gets weaker and may develop a high fever. Bile-stained vomit or currant jelly stools (stools with blood and mucus) suggest that time is of the essence. Without treatment, most children with intussusception would die within a couple of days. Children who are treated within the first 24 hours usually recover completely and quickly. Intussusception is suspected based on the history and the physical examination. Sometimes a sausage-shaped lump is felt in the belly between spasms. Sometimes the rectal exam is bloody. The diagnosis is confirmed with an imaging study such as ultrasound, x-ray, or enema using air or a water-soluble contrast. The same enema that is used to clinch the diagnosis is usually effective in reversing the intussusception. Sometimes surgery is needed. Usually intussusception cannot be prevented.